On the day following a great feast, the Orthodox Church always commemorates the main actor in the event. So, the day after Christmas is the Virgin Mary, the day after the Annunciation is the Archangel Gabriel, the day after Theophany (or Epiphany, the Baptism of Christ) is John the Baptist, etc. Accordingly, since yesterday was Pentecost, today, the Church holds a special commemoration of the Holy Spirit. As such, today was a holiday, all government was closed, and most shops were closed. My host, Fotis, left on Saturday for an island. Think of how Americans treat Memorial Day weekend...this holiday weekend is a bigger deal for Greeks. As a friend told me, "It's nice. In Greece, we still observe Holy Days." As a holy day, Services were held at St. Irene. Lycouros Angelopoulos put me on the spot and told me I would immediately sing the apolytikion of Pentecost in English. Quickly calling the text and melody to memory, I sang: "Most blessed are you, Christ God, who sent upon the Apostles the Holy Spirit. Through them, you have enlightened the whole world. Oh, Lord, glory be to you!" Immediately after, he told me to sing "As many as have been baptized into Christ have put on Christ, Alleluia" in English as well. It is encouraging to be so warmly welcomed by these artists whom I respect so much. I hope I can bring their love (and mine) of Byzantine ecclesiastical music back to America. 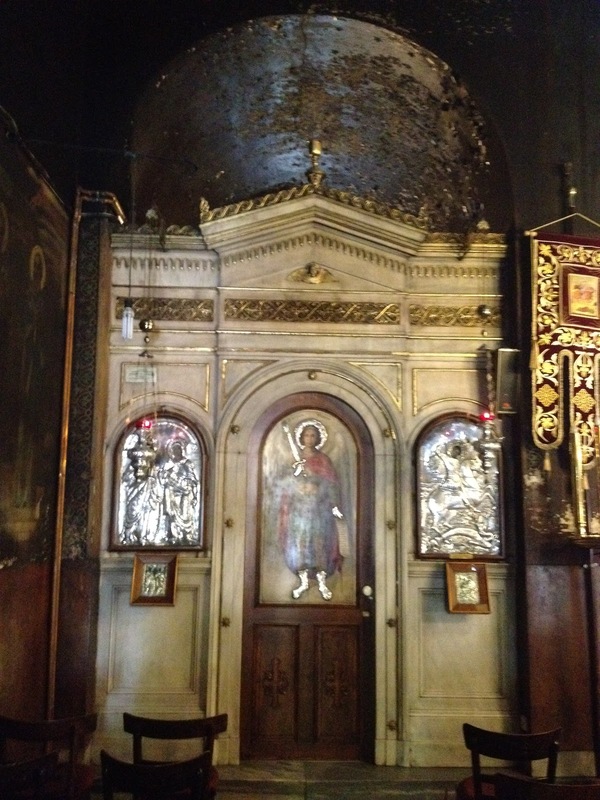 After liturgy, I walked to the church of the Holy Theodores. This is an ancient church named after two martyrs from Roman times, both were soldiers named Theodore who martyred for their faith in Christ. 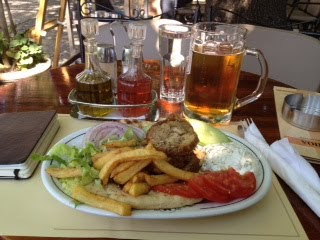 This evening, I had gyros for the first time in Greece. They were delicious, of course, but made from chicken, not lamb. I don't think that's even an option in Greek-American diners, but it's what was on the menu. The tzatziki sauce was great, made from Greek yogurt. The chicken gyro was served with lettuce, tomato, and french fries, and a generously seasoned with oregano. It was overflowing from one pita, so by the end, I was eating with a knife and fork. I also had an Alfa on draft, not bad. Maybe Greek beer could have its own post at a later time. My consensus at this point is that Greeks are really good at making wine and ouzo, and should stick to their strengths. After dinner, I called my teacher, Arvanitis. He would be out of town until late tonight; I will have my first lesson tomorrow. I also called Stelios Georgantonis (brother of the cantor Nikos from St. Irene). He is an iconographer who is a Chicago native. He regularly comes to this part of Athens for services at a small church in Plaka. We made plans to meet at the metro station (because the church is very difficult to find) tomorrow evening, go to vespers, then get coffee afterwards. To get my bearings, I decided to acquaint myself with Plaka, a neighborhood I had not yet visited. Plaka is the oldest part of Athens, and is situated at the base of the acropolis. 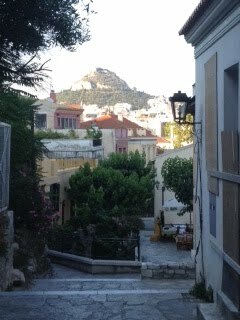 Until the Greek revolution in 1821, Athens was little more than a village, and Plaka is what remains. After the Greeks won independence from the Turks, Athens became the capital and a grand European city was built, so the rest of the city really dates from that time, with the exception of the ancient churches dotting the city. I came across the beautiful 11th century church of St. Katherine. 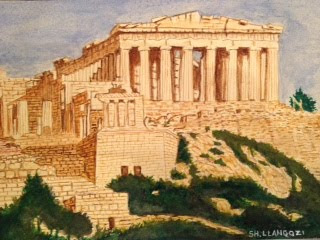 In its square, it had a number of ancient columns, and the acropolis is clearly visible looking out the front doors. 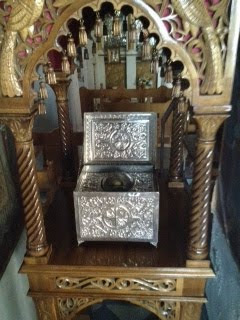 St. Katherine church has the skull of the Holy Martyr Polydoros. Most churches had signs that explicitly forbid photography (as well as wearing shorts). 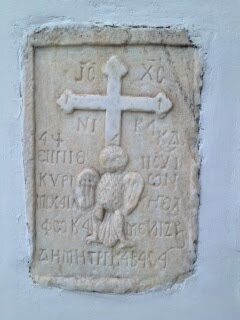 I've found that if I ask nicely, in Greek, and explain that I am studying iconography, then there is no problem. Because the churches are active places of prayers and worship, I think that the photographic prohibition is mostly so tourists don't disturb the prayers of the faithful with their flash. 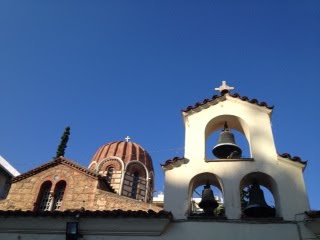 I was walking up a narrow street, and the houses and shops were interrupted by a small bell tower. Seeing a small sign of a church, I entered. I walked into the vespers in this quaint little church. I stayed. The presvytera (priest's wife) was chanting, and about a dozen people were present. I had stumbled upon the church where I will meet Stelios tomorrow. 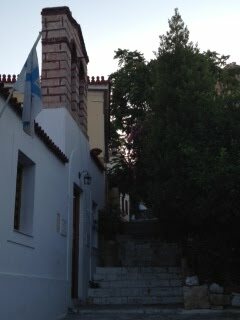 After vespers, another service started (compline, I assume), but I left to see more of Plaka. 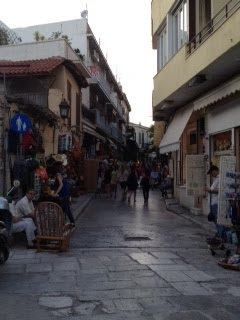 Plaka has many tourists, cafes, gift shops, street musicians, old buildings, narrow streets, and ruins. The acropolis (still waiting for my wife) is on the corner of Apostolou Pavlou and Dionysiou Areogapitou (yes, the streets are named after saints...Greece is awesome). After all, near the acropolis is where the Apostle Paul preached to the philosophers about the "unknown God." Dionysius the Areopagite was converted and became the first bishop of Athens. Anyway, I turned down Dionysiou Areopagitou towards the acropolis. I passed the ancient amphitheater of Herod Atticus, which billed an opera this weekend. I think I will take Bekah. The back of the amphitheatre of Herod Atticus, the acropolis inn the background. On the way back, I passed a painter on the street. We spoke in Greek. I told him how much I liked his paintings and that I teach art at an elementary school. Being a sucker for original art, I felt like I should support him. I bought this painting for his asking price, which was a little bit of nothing. He was so happy, he gave me a hug. The painting I bought from a painter on Dionysiou Areopagitou.